Chemicals in Cosmetics is a major health concern. According to a recent research in the United States, one out of every 10 ingredients used are chemicals from industry. Personal care products like creams contain pesticides, carcinogens and hormone disruptors. 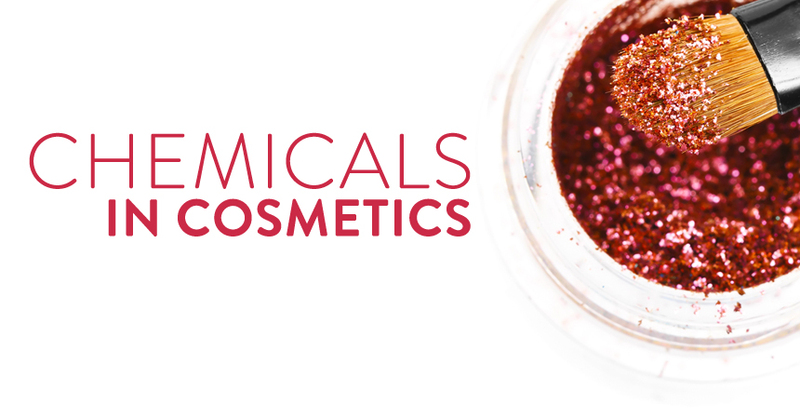 These chemicals in cosmetics can cause hormone problems and even cancer. Cosmetic products also contain harmful plasticisers which are used as building materials and can cause disruptions in blood flow leading to many diseases. Around 80 percent of the beauty products tested were found to have toxins. Women are exposed to the products the most, and this could be the reason behind the recent upsurge in health issues among women. Let us take a look at three chemicals which are the major reasons for Pollution in your products. (1) Butylated Hydroxyanisole – These are synthetic antioxidants used in lipsticks and moisturisers as preservatives. Prolonged exposure to this chemical can cause disruptions in the Endocrine system leading to hormonal problems. This chemical can also promote the growth of tumours. (2) Colours derived from coal tar – Most of the dyes used to colour hair contain dyes derived from coal tar. P-phenylenediamine is one of the chemicals in colours derived from coal tar and has been a proven cause of cancer of the lymph nodes. (3) Diethanolamine – This chemical is used to make the cosmetics creamy and for adjusting the pH. It is found in cleansers, soaps, shampoos and even in sunscreen lotions. Long exposure can cause liver damage and hormonal disruptions. The next time you go to buy cosmetic products, watch out and be careful. Even so called organic products are not free of these extremely dangerous chemicals.